Are you looking for something nutritious and delicious? This Sweet Potato, Coconut and Chai Loaf is a wonderful alternative to your normal every-day cake. You can simply omit or reduce the sugar, and you have a wonderful breakfast bread that toasts beautifully, or lunchbox snack. This loaf packs a nutritious punch with the base being sweet potato and ground almonds (see recipe for nut-free alternatives). This means that the loaf contains fibre for a healthy digestive system and will fill you up quicker than your average piece of cake. Sweet Potato has a low GI, which provides a good source of slow release carbohydrate to give energy. Much more nutritious than your average bakes goods made on white flour. 2 cups of almond meal or ground nuts (see method). 1/4 cup olive oil (you can substitute with coconut oil if you wish but before you do, read my view on coconut oil here). 2. For this recipe you can simply use almond meal (ground almonds), or finely grind your own whole almonds in a high speed blender. 13. Bake for 30 minutes, until brown and a skewer inserted into the middle comes out clean. 14. Remove from oven and leave in tin to cool. 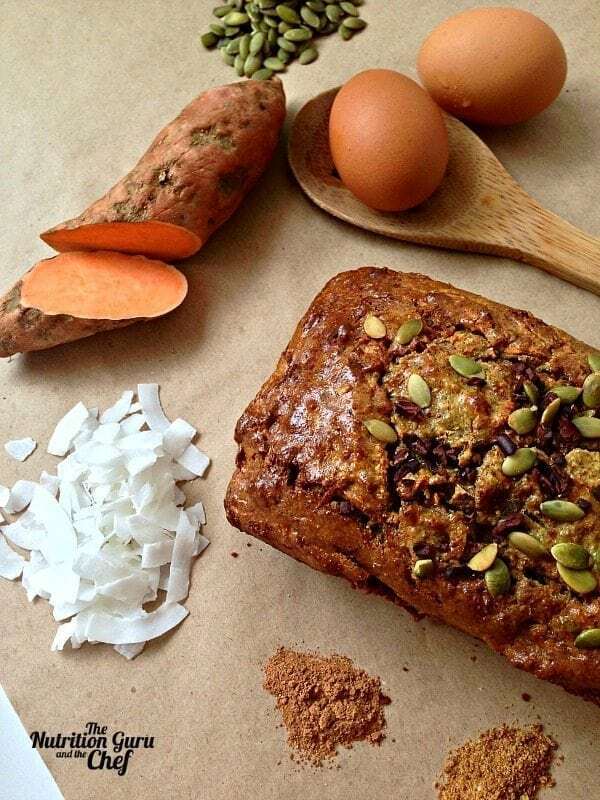 Baked this delicious & healthy sweet potato, coconut and chai loaf with the kids this morning. Great recipe @thenutritionguruandthechef and super easy for the kids to make. I am a big believer in getting the kids involved in cooking at a young age, so many benefits from teaching them about different foods, scientific cooking properties, maths skills and the bonus with this recipe was extra Veges today! ?? Pingback: Gluten Free Sweet Potato & Coconut Bread | Jenn Loves Thermie! That looks delicious. I assume you could get away using almond flour? This is fabulous! Made it yesterday with the almond pulp I had leftover from making milk and it is absolutely delish. Thank you. Do you know if any egg substitutes work in this recipe? Thank you so very much! It’s a favourite in our house! Yum! Just made these in muffin cases instead of a loaf- perfect treats to get me through the week!